It is very important to keep in mind with sensitive natural stone to only use cleaners that were specifically designed for them, such as the ones we sell here. If you are considering using another cleaner on your granite, marble, travertine, limestone, slate, or other natural stone floor do your research first! These cleaners can interrupt the chemistry of the stone and destroy, scar, weaken, or stain your stone. The higher the acidity, such as in cleaners like vinegar and bleach, the worse it is for your stone. 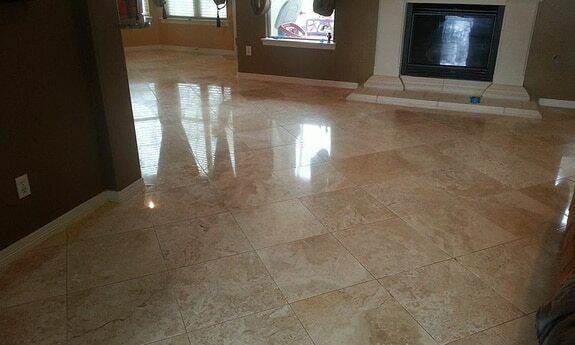 While with all flooring it is important to clean and remove dirt and dust, it is especially important when it comes to your home’s natural stone floors. This is because you will track and carry around on the bottom of your shoes and feet, particles that will be pushed into the stone. This can lead to etching into the stone, as well as it can wear down the protective seal your stone floors have as a barrier of defense against etching and stains. Avoid this by dry mopping your floors regularly. The more wear you put on your floors, such as if you have heavy traffic on your floors, kids, a pet, etc.- the more frequently you should dry mop your floors. Lots of homeowners first instinct when they see a stain on their gorgeous stone floors is to try and scrub the stain out of the stone. However, this is the absolute worst way to handle a stain for stone floors. For regular cleaning, get a soft cloth and be gentle. If you get a stain or need a deep cleaning for another reason, contact Modern Stone Care and set up a professional cleaning that will leave your floors healthy not damaged. Whenever you have natural stone floors in your home it is imperative to have your floors sealed in order to keep them safe from etching, stains, and other damage that will affect the lifespan of your stone. Getting an initial seal on your floors will not be enough to keep them healthy for a lifetime. It is important to make sure they stay sealed over time. We can come and check the condition of your stone’s seal to see if it is thick enough to guard your stone or if it needs to be redone.